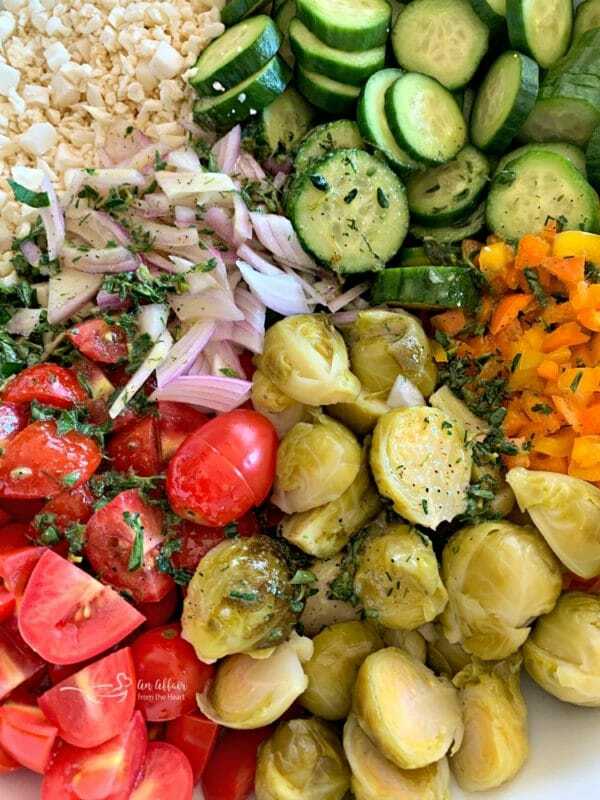 Salad made with fresh veggies and cauliflower rice, combined with dilled Brussels sprouts and topped with a simple dressing made with fresh lemon, oil and Greek herbs. This Greek Cauliflower Rice Salad with Brussels Sprouts is exactly what needs to accompany your first grilled meal of the season. I don’t know about you, but we could hardly wait to take the cover off of our grill when the snow melted. The first thing we grilled were steaks. I baked some potatoes and we had this amazing salad I created using Paisley Farm Dilled Brussels Sprouts. 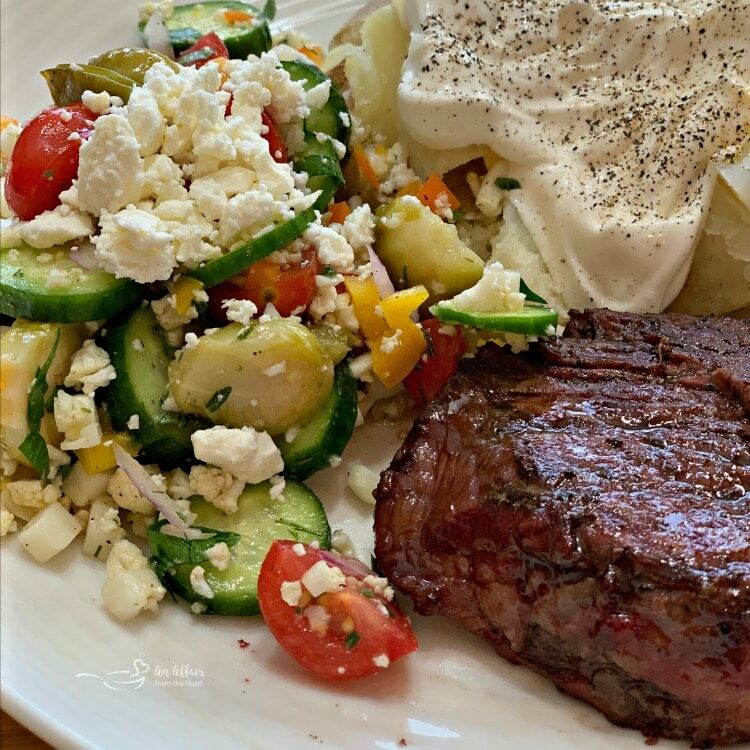 I tossed some crumbled feta on top of mine, and if we weren’t a family divided when it comes to olives, I would have added those, too! This post is sponsored by Paisley Farm Foods, but my opinion and love of their products is all my own. Are you looking for something fresh, colorful and inviting to grace your table this spring? Maybe you need something for your Easter table? This Greek Salad is just the thing. It will pair nicely with whatever main course you are serving. I typically make ham and Polish sausage for Easter. But we have been known to do a prime rib roast, or even throw steaks on the grill if it’s nice. My Mother-in-Law makes life easy, and caters in fried chicken, and we all bring something to have as side dishes. 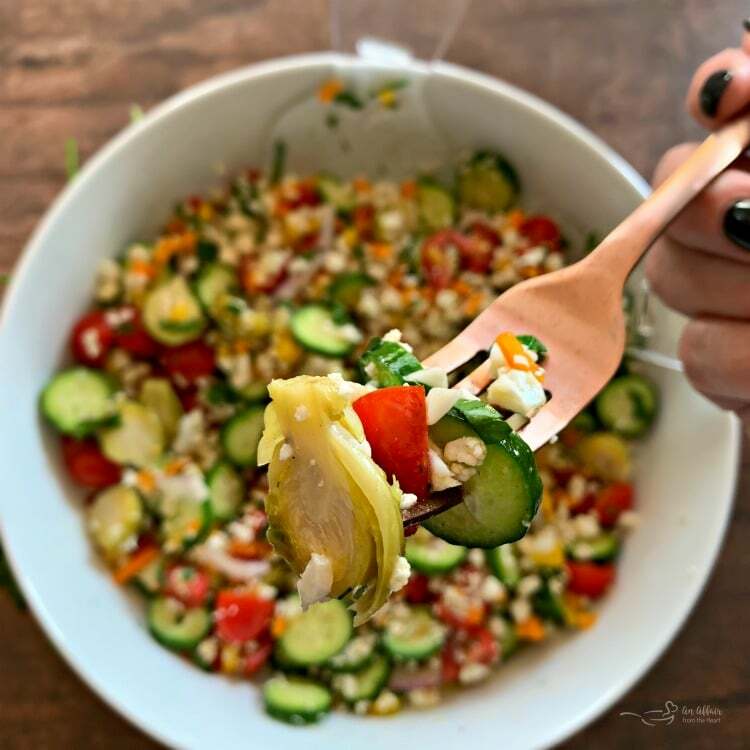 Whether you’re are eating potluck, picnic style, or a fancy sit down dinner, this fresh veggie salad will be a winner. 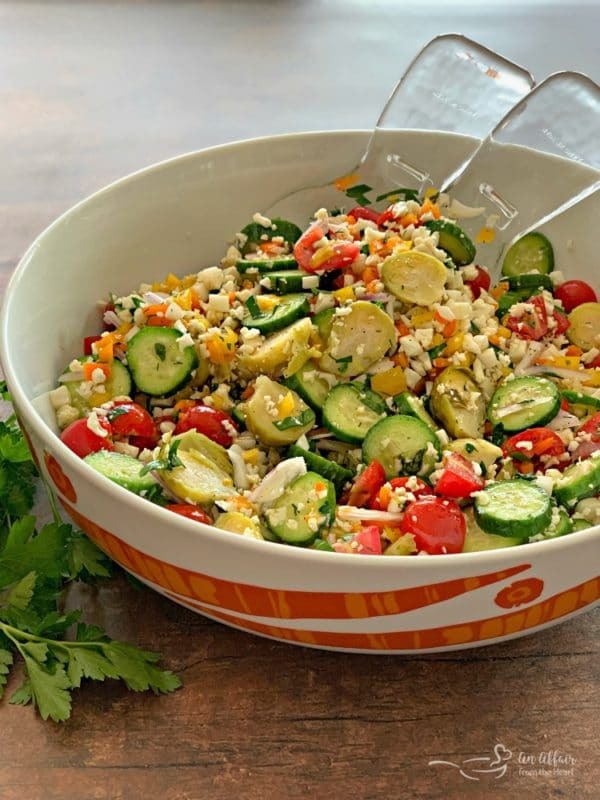 This salad combines crunchy fresh veggies like cucumbers and cauliflower rice with the sweetness of orange and yellow peppers and grape tomatoes. It’s kicked up a notch with fresh parsley, red onion and Paisley Farm Dilled Brussels Sprouts. Top it off with a simple homemade Greek dressing, made with lemon, oil, and Greek herbs and spices. Then dig on in! All of Paisley Farms products are now available at Kroger and Kroger-affiliated stores and they are expanding to new retail chains throughout this calendar year! Their Brussels Sprouts come in two varieties. Dilled and Hot. 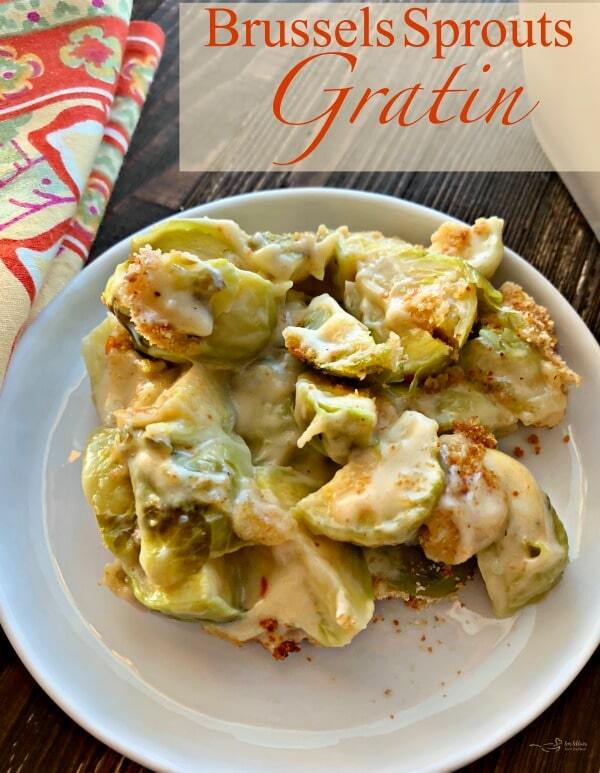 I used the hot Brussels sprouts in this Brussels Sprouts Gratin dish last fall. So delicious! I have been blessed to be able to develop recipes for Paisley Farm since 2015. They are an amazing company! Please be sure to visit Paisley Farms website for recipes, products and store locations. 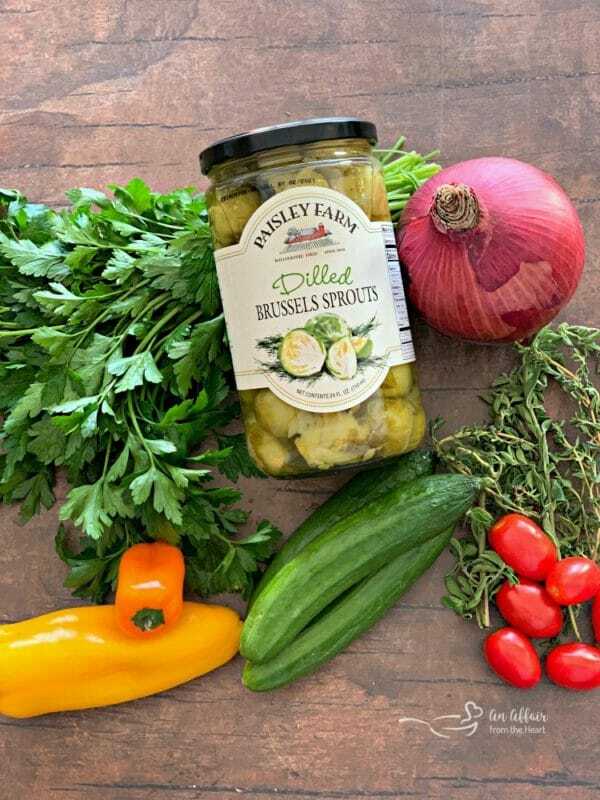 Paisley Farms is on FaceBook, Instagram and Pinterest, where they share great new recipes and product tips year ’round! 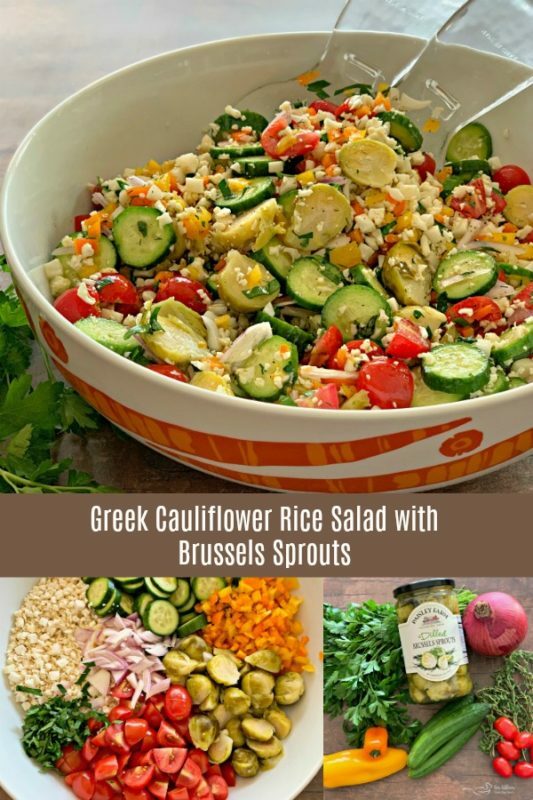 How will you serve this Greek Cauliflower Rice Salad with Brussles Sprouts? 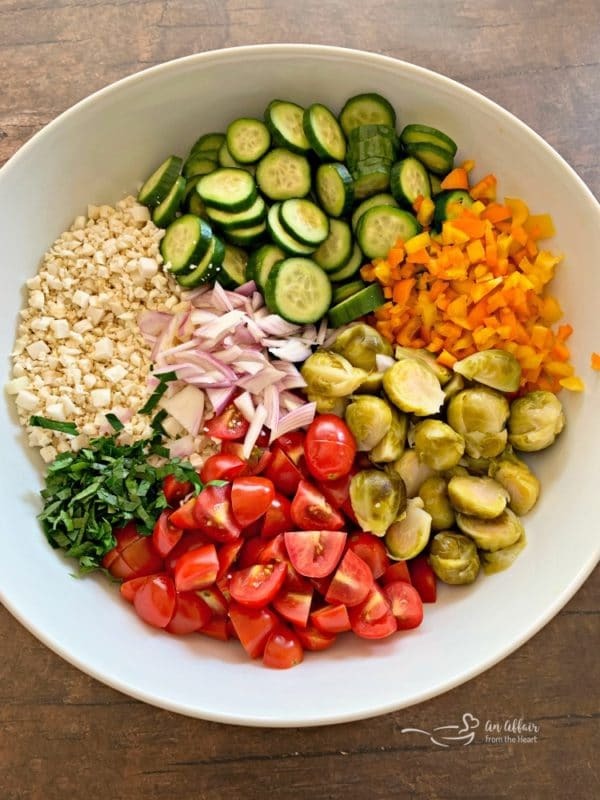 Combine all of the veggies in a big bowl. Chill until ready to eat. Top with Feta cheese if desired. Also very good with Kalamata olives! So good! Love this salad alongside any meal. I love the look and sound of this salad! As you say great with a BBQ. Not sure I can find those dilled sprouts here in Italy! They sound delish! This cauliflower rice salad looks fantastic! The perfect side dish or even a light lunch. Can’t wait to make this. Brussels sprouts from a jar?! Who knew! I bet this salad vanishes quickly once placed on the dinner table. Looks delish! Mmmmm this looks so fresh and healthy. Would make a perfect side dish for upcoming bbq season. OH! You had me at Greek! Perfect for this time of year too! Awesome! We love Brussels!! This looks so inviting and fresh! Dilled brussels sprouts… wow. Your salad looks great. What a beautiful salad. It just screams summer and I love the convenience of using the Paisley Brussels Sprouts. That will help get this salad on the table in a jiffy! Pinned, bookmarked and wrote out my shopping list to make this today! What a delicious salad with all those veggies. Meal prepping for next week’s lunch. Thanks! This salad looks just like me! I love the addition of the dilled sprouts and the feta. I’m on team no-olives, so I’m happy without them! Can’t wait to make this when summer comes! Love how fast and fresh this salad is! You had me at the Brussel Sprouts! What a great way to add some bright life to an everyday salad, delicious!! Cauliflower rice is my favorite new friend and I am always looking for new takes on it. I love this salad, it’s fresh and delicious. threw this together at the last minute and it was such a hit! Used it at our local neighborhood potluck… everyone LOVED it! Yay!!! Easy salads for the win!! This is Awesome! I love everything about this Greek Cauliflower rice salad. Especially the dill Brussels Sprouts.